All listings are from our private collection and are professionally serviced and running in our state of the art clock shop. 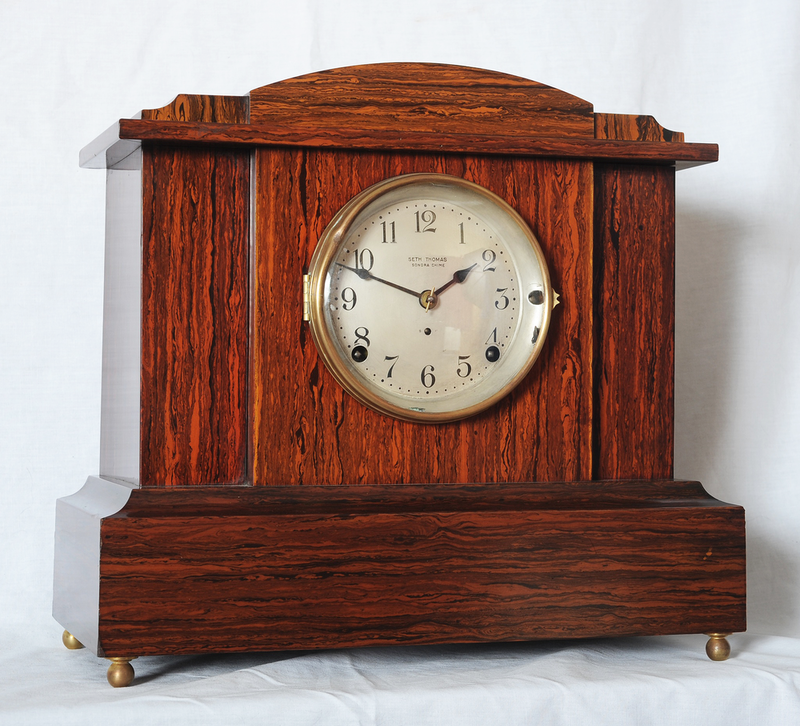 If you find a clock you like in the listings, call us and we will provide more details or pictures if needed, answer any questions, and supply shipping/delivery options. Prices shown are FOB our shop. Rare Seth Thomas Five Bell Sonora. Rosewood adamantine finish is flawless. The exclusive sonora bells play Westminster chimes on the quarter hours and strike the hours at the "12" position on a silvered dial. (12" wide, 14" high, 8" deep). Original Ansonia (Wyoming) porcelain time and strike mantel clock. 3/8" wide hand tooled cast brass bezel with heavy glass beveling. Strikes once on the half hour and the hours at the "12" position. Case is flawless. (10" wide, 12" high, 5" deep). Stunning Egyptian motif solid marble mantel clock with flawless case. Features a jeweled "open" escapement. Strikes once on the half hour and the hours at the "12" position. Hand tooled bezel with a heavy beveled glass. Hand engraved hieroglyphs in gold on the black and gray toned marble case. (16" wide, 10 1/2" high, 7" deep). Superb Herschede mantel clock. Plays Westminster chimes on quarter hours and strikes on the hour. This rare Herschede is carved and shaped like no other. The dial is hand engraved with exquisite detail. ( 22" wide, 11 1/2" high, 7 1/2" deep). Solid oak school house wall clock. Battery powered with brass pendulum. Solid oak wall clock. Strikes appropriate number of times on the hour and once on the half hours. Stunning Howard Miller wall clock with spring-wound German movement that plays Westminster, Whittington, and St. Michaels chimes on quarter hours and separate tone on hours. Flawless solid mahogany case with selected burl veneers and beveled glass door. Elegant Trend (division of Sligh) Westminster chime wall clock. Solid mahogany case is decorated with selected burl veneer columns and gold accented glass. Powered by a German movement with exclusive brass pendulum. It plays chimes on quarter hours and strikes on hours. European (French) deco Westminster chime wall clock. Maple tone case decorated with matching veneers on columns. Light blue tone dial with brass pendulum. Spring-wound movement chimes on quarter hours and strikes the hours. Gorgeous and rare Foster Campos weight driven banjo timepiece. Case is pure perfection with meticulous inlays and reverse painted glass, cast brass dial bezel and waist struts. This clock is truly a functional work of art that will last for generations and never lose its value. Elegant spring wound time and strike Vienna Regulator. The German movement strikes on the hour and half hour. The flawless case has original turned ebony finials contrasting selected burl veneers. The meticulously matched veneers is carried throughout the clock and provide a stunning backdrop for the massive brass pendulum.This clock is truly a work of art! Magnificent Charles R. Sligh Limited Edition Floor clock. Fluted 3/4 hand tooled columns. Triple chime (Westminster/Whittington/St. Michaels) with automatic night shut-off (stops at 10 P.M. and begins again at 7:30 A.M.). Hand engraved brass dial with moon phase indicator. Hand engraved lyre pendulum. Several exotic hardwoods and veneer inlays. Beveled glass front, side panels, and upper side doors. Exquisitely hand finished flawless case with hand carved pediment and base, and patented brass hinges. 92" high, 27" wide, 18" deep. Magnificent cable wound, two weight Elliot floor clock with unique turned pediment spire finials. Strikes time in dramatic tones on tuned coils. Originally sold by Smith-Patterson of Boston. Hand painted moon-phase indicator over the intricately engraved dial. Silvered chapter displays gold plated oversize numerals. Case is solid walnut over claw-carved feet and topped by fluted hood columns. Herschede nine-tube floor clock. Unique petite size contains the full throated Herschede sound on 9 tubular bells. Classic American made Herschede movement powered by 3 weights on cables. Gold plated dial signed by Herschede contains hand-painted moon phase indicator. Triple chimes include Westminster, St. Michaels, and Canterbury melodies on quarter hours with hourly strikes. Case is flawless solid mahogany. Weights and Pendulum are factory fresh with satin finish. This clock is a Herschede original.